Objective Genome-wide association studies (GWAS) have identified genetic variants within multiple risk loci as predisposing to intestinal inflammatory diseases, including Crohn's disease, ulcerative colitis and coeliac disease. Most risk variants affect regulation of transcription, but a critical challenge is to identify which genes and which cell types these variants affect. We aimed to characterise whole transcriptomes for each common T lymphocyte subset resident within the gut mucosa, and use these to infer biological insights and highlight candidate genes of interest within GWAS risk loci. Design We isolated the four major intestinal T cell populations from pinch biopsies from healthy subjects and generated transcriptomes for each. We computationally integrated these transcriptomes with GWAS data from immune-related diseases. Results Robust, high quality transcriptomic data were generated from 1 ng of RNA from precisely sorted cell subsets. Gene expression patterns clearly differentiated intestinal T cells from counterparts in peripheral blood and revealed distinct signalling pathways for each intestinal T cell subset. Intestinal-specific T cell transcripts were enriched in GWAS risk loci for Crohn's disease, ulcerative colitis and coeliac disease, but also specific extraintestinal immune-mediated diseases, allowing prediction of novel candidate genes. Conclusions This is the first report of transcriptomes for minimally manipulated intestinal T lymphocyte subsets in humans. We have demonstrated that careful processing of mucosal biopsies allows the generation of transcriptomes from as few as 1000 highly purified cells with minimal interindividual variation. Bioinformatic integration of transcriptomic data with recent GWAS data identified specific candidate genes and cell types for inflammatory pathologies. GWAS studies have identified large numbers of genetic risk loci associated with increased risk of developing intestinal inflammatory disorders, but most risk variants are non-coding and are believed to act through regulation of gene expression in a cell-type specific manner. Many IBD risk loci contain multiple ‘candidate genes’. For many the causal gene has not been defined and little is known about the cell types which may be most relevant for their functional effects. T cells resident within the intestinal mucosa represent the largest accumulation of T cells in the body and play a prominent role in regulation of mucosal inflammation. Intestinal T cells differ markedly from T cells in the peripheral blood in terms of surface marker expression. Little functional data is available for intestinal T cells and their gene expression patterns have never been characterised at a transcriptional level in healthy humans. We report the successful isolation and full transcriptional analysis of the four major T cell populations of the human intestinal mucosa. Precise bioinformatic analysis provides insight into human mucosal T cell specific gene expression patterns and signalling pathways. Overlaying expression and genetic data allows the identification of candidate genes and candidate cell types for explaining the functional impact of GWAS risk loci. The identification of gut specific expression patterns and candidate genes at GWAS risk loci permits targeted therapeutic strategies for regulation of gut inflammation. The capacity to generate transcriptomic analysis of cell populations from biopsies offers a new approach to assess at a molecular level the cell-specific impact of therapeutic interventions. The need to capitalise upon genetic data to gather functional insight is particularly felt in inflammatory diseases of the GI tract, where a number of high quality genome-wide association studies (GWAS) have been performed. Importantly, while a range of immunocytes are present in the GI mucosa and contribute to inflammatory homeostasis, T cells represent the dominant population.10 Intestinal T cells appear to be tissue resident, show minimal recirculation in the peripheral blood,10 ,11 and exhibit fundamental differences to those found in other sites in terms of cell surface marker expression, activation pathways and putative function.10 ,12 These cell populations therefore represent plausible candidates in which causal genetic variants might exert their effects. Practical limitations prevent the generation of an eQTL data set for human intestinal T cells due to difficulties accessing these populations in large numbers of subjects. As an alternative, transcriptomic data can provide a genome-wide assessment of population characteristics and allow unbiased identification of genes of functional relevance.13 In particular, those genes upregulated in intestinal T cells compared with a reference peripheral blood T cell population might be of particular importance for intestinal immune homeostasis and afford insight into the unique nature of intestinal T cell populations. We reasoned that testing of the overlap between these upregulated genes and GWAS risk loci for inflammatory disease would identify genes of importance for intestinal immune homeostasis potentially subject to transcriptional regulation modulated by disease-associated genetic variation. Further, that this would provide a novel approach to the identification of candidate risk genes. Intestinal T cells can be divided into two distinct populations: intraepithelial lymphocytes (IELs) reside interspersed among intestinal epithelial cells, and lamina propria lymphocytes (LPLs) are resident in the deeper stromal layer. In the present study our first aim was to generate transcriptomic profiles for the four most abundant T cell populations of the healthy human intestine (CD4 and CD8 IELs, and CD4 and CD8 LPLs), along with paired reference populations from peripheral blood. The transcriptional profile of each subset is here made available as a resource. Using strictly defined anatomical, physiological and pathological criteria, we have successfully minimised the interindividual variability that often confounds human studies, while an optimised experimental workflow, precise polychromatic flow cytometric sorting and robust computational analysis further increased data reliability. We next subjected these transcriptomes to in silico analysis to generate insight into activity within these cell populations through analysis of genes showing differential expression between intestinal and peripheral blood T cells. Finally, we sought to determine the enrichment of genes differentially overexpressed in these critical gut immune cell populations within risk loci identified by GWAS in a number of immune-mediated diseases, and align these to existing functional knowledge regarding genes at these loci. Six healthy non-smoking female subjects aged 33–52 years, taking no regular medications who were undergoing ileocolonoscopy for screening purposes, were recruited for biopsy collection. The terminal ileum (TI) was chosen for a number of reasons: it represents a reliable anatomical landmark, is the most common site of first presentation of Crohn's disease (CD),17 and is the site of highest density of luminal microbes in the small intestine.18 No appreciable abnormalities were noted macroscopically, nor were any histological abnormalities noted on routine biopsy analysis. Subjects received a standardised bowel preparation and underwent the procedure in the morning. Eight pinch biopsies were collected from the TI with visual avoidance of Peyer's patches as well as of previously sampled areas. Biopsies were collected into medium on ice and processed immediately, and 10 mL of peripheral blood was also collected into tubes containing 15 mg EDTA. Ethical approval was granted by the Cambridge National Health Service Research Ethics Committee, reference 01/418. TI biopsies were suspended in calcium and magnesium free medium with 2 mM EDTA and 1 mM DTT and agitated for 30 min with three changes of media. At each stage, supernatants (containing the IEL fraction) were separated off using a 70 μm cell strainer. After the last media change, the remaining fragments were dissociated through incubation with 200 U mL−1 collagenase IV for 1 h, prior to washing through a 70 μm cell strainer. Peripheral blood mononuclear cells were separated by centrifugation over a Nycodenz density gradient. All isolation steps with the exception of enzymatic digestion were performed at 4° C. Cells were stained with an antibody cocktail comprising monoclonal antibodies (mAb) to CD19 (HIB19), CD326 (9C4), TCRαβ (IP26), CD62L (DREG-56), CD45RO (UCHL1), CD8a (HIT8a), CD4 (RPA-T4), CD3 (SK7) and CD8β (2ST8.5H7). After the final antibody wash step, 4′,6-diamidino-2-phenylindole was added to washed cells, to enable live/dead discrimination. A strict phenotypical definition was applied for sorting to avoid population contamination, as CD3+TCRαβ+ CD19− CD326−/lo 4′,6-diamidino-2-phenylindole− CD62L− CD45RO+, further subcharacterised as CD4+CD8α− CD8β− or CD4− CD8α+ CD8β+. Cell separation was performed using a BD Facs Aria III cell sorter with cells sorted directly into chilled cell lysis and RNA stabilisation buffer (Buffer RLT, Qiagen) prior to storage at −80° C. Sort purity was verified to >99% prior to and after each sort. To minimise cellular perturbation, sorting was performed using a 100 µm nozzle at low sorting pressures using chilled, preservative-free PBS. Total RNA was isolated from sorted cells using RNeasy micro kits (Qiagen) for expression analysis using Human Gene ST 1.0 microarrays (Affymetrix). A number of specific laboratory and computational measures were undertaken to enable reliable transcriptomic analysis using just 1 ng of RNA from each cell population, as detailed in the online supplementary material. Genes showing differential expression were used for pathway analysis with Ingenuity Pathway Analysis (Ingenuity Systems) and enrichment significance determined by Fisher's exact test, and for protein-protein interaction modelling as detailed in the online supplementary material. Testing for enrichment of differentially expressed genes within genetic risk loci, as well as analysis of enrichment of transcription factor chromatin immunoprecipitation sites were performed as described in the online supplementary material (Accession code. GEO: microarray data, GSE49877). We extracted IELs and LPLs from pinch biopsies of the TI taken during ileocolonoscopy from six healthy, non-smoking female subjects aged 32–55 years taking no regular medications. Extensive measures were taken to minimise interindividual variation and ex vivo cellular perturbation (see online supplementary methods). Precisely defined CD4+ and CD8+ T effector memory (TEM) cells were purified from biopsies and paired peripheral blood samples according to a strict phenotypical definition, using polychromatic sorting (see methods). Peripheral blood TEM cells may be identified as CD45RO+ CCR7− and express variable levels of CD62L.19 However, we find CD45RO+ CCR7− T cells in the gut do not express CD62L, and likewise gut CD45RO+ CD62L− cells do not express CCR7 (20 and data not shown). For this reason, we used CD45RO+ CD62L− to define TEM cell populations. Since most gut T cells belong to the TEM subset, in contrast to peripheral blood T cells, which predominantly bear a naïve or central memory phenotype,21 ,22 this approach results in the identification of TEM cells in the blood and gut with a closely matched cell surface activation phenotype and thus minimises biasing comparative analysis towards pathways associated with cellular activation and memory (see online supplementary figure S1A–F). The use of fresh biopsy tissue from healthy individuals (rather than much larger tissue sections from the margins of diseased explants, where results are likely to be biased by the underlying pathology or perioperative factors including variation in ischaemic time and concomitant medication) resulted in cell yields in the 103–104 range. This necessitated RNA amplification with just 1 ng RNA of starting material from each population, which we achieved without the introduction of 3′ bias or loss of interarray signal array concordance that can occur with in vitro transcription based amplification technologies (see online supplementary figure S1G,H).23 In order to maximise reliable signal/noise discrimination and allow detection of low abundance transcripts that are often excluded from such analyses, without reduction in the statistical power to detect differentially expressed genes,24 we used a sophisticated analysis approach, based upon comparison of the signal from each of the probes in a given set to that from non-expressed control probes matched for GC-content. Pairwise analysis of gut TEM cell populations with phenotypically matched cells from the peripheral blood of the same individual further increased statistical power. The expression data set is publically available (Gene Expression Omnibus accession number GSE49877 http://www.ncbi.nlm.nih.gov/geo). Within the total data set we detected 9468 gene transcripts that passed filtering criteria, of which 2868 (30.2%) showed differential expression between at least one pair of TEM populations and 1712 (18.2%) showed differential expression between one or more gut populations and the paired peripheral blood TEM population (≥1.4-fold change; adjusted p<0.05), already highlighting the fundamental differences in tissue-resident compared with peripheral blood T cells. Greater overlap of differentially expressed transcripts was observed between CD4+ and CD8+ TEM cells from the same gut compartment than between LPLs and IELs (see online supplementary figure S2). Importantly, principal variance component analysis confirmed that the largest determinant of variance came from tissue source (LPLs vs blood vs IELs) with cell type (CD4+ vs CD8+) showing less contribution, and interindividual variation accounting for <5% of total variance (figure 1A), an observation borne out by unsupervised hierarchical clustering analysis (figure 1B). k-means clustering analysis identified transcripts showing similar expression patterns associated with IEL and/or LPL and blood TEM populations (figure 1C). Analysis of human TEM transcriptomes reveals compartment-specific signatures. (A) Effective removal of batch effects and minimisation of patient-of-origin variables within the expression microarrays. After initial background correction and normalisation, expression microarray data were subjected to correction for known potential batch effects within the data set. The effect size of known variables, including batch assignment, patient of origin, tissue source (IEL, LPL or blood) or cell type (CD4 or CD8) were then tested by PVCA which estimates the proportion of total variance within the data set that may be attributed to each variable. (B) Unsupervised hierarchical cluster analysis of transcriptomes from human gut and blood TEM cells using the 500 transcripts showing the greatest variance. (C) k-means cluster analysis was performed on transcripts showing ≥1.4-fold change in mean expression values between at least one pair of TEM cell populations and a within-sample coefficient of variation ≤0.5. Expression levels for genes in the 8 most discriminant clusters are shown, based upon maximisation of the between-group difference in centre-weighted expression values, with the number of transcripts in each cluster (n) indicated along with representative examples of transcripts from the cluster. Row mean-centred expression levels are shown, with red representing above average expression and blue representing below average expression (red-blue colour bar upper right). Array column order in C is preserved as determined by hierarchical clustering in B. (D) Top upregulated canonical immune signalling pathways based upon Ingenuity pathway analysis of transcripts upregulated in intestinal TEM cell populations relative to paired peripheral blood TEM populations. Each list of differentially expressed genes is assessed for the proportion mapping to relevant immune canonical signalling pathways, and the result compared with that observed in the entire data set to calculate significance. p values after correction for multiple testing are indicated by background colour (yellow-red colour bar bottom right). IEL, intraepithelial lymphocytes; LPL, lamina propria lymphocytes; PVCA, principal variance component analysis; TEM, T effector memory. Transcripts showing differential expression in gut TEM cells included several with little or no previously described role in T cell biology as well as many previously implicated from murine studies as involved in T cell trafficking, activation, regulation and co-stimulation. (figure 1C, see online supplementary figure 3A,B). Transcripts significantly upregulated in all gut populations included integrin ITGAE (CD103, integrin αE), CCR9, CCL20 and RGS1 (regulator of G-protein signalling 1), all involved in homing of T cell to the gut,25–28 while ITGA6 (integrin α6), ITGB1 (integrin β1), ITGB2 (integrin β2) and CXCR3 were significantly downregulated across all gut populations. CXCR3 is implicated in the trafficking of peripheral blood TEM cells into inflamed bowel,29 ,30 but does not appear to be highly expressed under homeostatic conditions by gut resident TEM cells. S1PR1 and S1PR4 (sphingosine-1-phosphate receptors 1 and 4, respectively), regulators of T cell activation and lymphoid organ egress,31 were downregulated in gut T cells. Reflecting tight anatomical compartmentalisation, we noted a number of IEL-specific and LPL-specific adhesion molecule and chemokine associated transcripts, including ICAM1, CD38, CD44, CD97, CCL3, CCR6 and CXCR4 all upregulated in LPLs but not IELs, while CEACAM1, CEACAM5, CCL14, CCL15 and CCL25 were upregulated in IELs but not LPLs (figure 1C, and data not shown). The importance of IL-17A signalling in intestinal T cells was supported by pathway analysis, which also showed evidence for signalling through both receptors for tumour necrosis factor α, TNFR1 and TNFR2, as well as multiple alternative pathways of T cell activation and regulation, including the glucocorticoid receptor (NR3C1), CD27 and 4-1BB (figure 1D). Protein-protein interaction modelling reinforced these findings, with evidence of NR3C1 signalling in LPL T cell networks, as well as NF-κB signalling (see online supplementary figure S4), consistent with TNFR signalling as suggested by pathway analysis. Indeed, multiple NF-κB pathway members were all upregulated in CD4+ and CD8+ LPL TEM cells, including NFKB1, NFKB2, REL and RELB, as well as their associated regulatory and target genes, including NFKBIA (IκBα), NFKBID (IκBδ), NFKBIE (IκBε) and NFKBIZ (IκBζ). Genes differentially expressed in gut TEM cell populations relative to peripheral blood TEM cell populations may be predicted to be important for gut immune homeostasis. Perturbations of this homeostasis are implicated in a number of inflammatory diseases in humans, affecting the intestine itself and other organ systems.39–41 We reasoned that GWAS of intestinal inflammatory diseases might identify genetic loci containing genes important for intestinal immune homeostasis, and hence be enriched for genes showing differential expression in intestinal T cells under steady-state conditions. To this end, we defined a genomic interval extending 0.2 centiMorgan (cM) either side of the ‘focal’ single nucleotide polymorphism (focal SNP—ie strongest association signal) for each confirmed GWAS susceptibility locus for a range of common diseases and traits. We then assessed the frequency with which these intervals contained a transcript which we found to be upregulated or downregulated in any of the four gut TEM populations relative to their paired peripheral blood TEM population. We compared the degree of overlap observed with background distributions generated by repeat testing of equivalent numbers of transcripts selected at random from the total data set of TEM expressed transcripts, regardless of differential expression (figure 2). 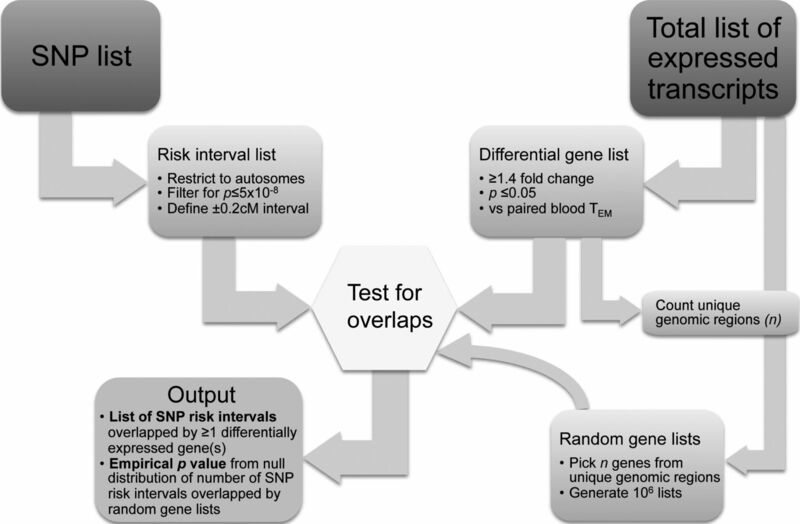 Overview of the algorithm for testing for association between focal SNP lists from GWAS studies and lists of differentially expressed genes. Lists of focal SNPs were filtered for genome wide significance and autosome mapping, and assigned a genomic interval extending 0.2 cM either side. The fraction of SNPs with intervals overlapping one or more differentially expressed transcripts was then calculated. The significance of this overlap was calculated, based upon repeated testing of the overlap of a random selection of transcripts from the list of all transcripts expressed in the data set, regardless of relative expression. In each iteration of the random sampling algorithm, the number of transcripts selected corresponded to the total number of unique genomic regions represented in the original differential gene expression list. GWAS, genome-wide association studies; SNP, single nucleotide polymorphism; TEM, T effector memory. We first tested three common GI inflammatory diseases for which high quality GWAS data have been generated and which demonstrate confirmed association with multiple independent risk loci: CD, ulcerative colitis (UC) and coeliac disease (CeD). For all three diseases, we noted marked convergence between genetic risk loci and transcripts upregulated in LPL TEM cells relative to peripheral blood, reaching statistical significance in all instances apart from CD4+ LPL TEM cells in UC (figure 3). In keeping with evidence for IELs and LPLs playing a key role in the pathogenesis of CeD42 ,43 we also found significant enrichment at CeD risk loci for transcripts upregulated in IEL TEM cells. More significant enrichment observed with CD and CeD compared with UC risk loci may reflect the colonic focus of UC, whereas in our study the TEM cells were extracted from small bowel biopsies. Risk loci for intestinal and non-intestinal inflammatory pathologies are enriched for genes upregulated in gut TEM cell populations. Genetic risk loci associated with a range of diseases and traits, as indicated, were tested for overlap with transcripts showing upregulated expression in specific intestinal TEM cell populations relative to paired peripheral blood TEM cell populations, according to the algorithm illustrated in figure 2. The proportion of risk intervals containing one or more differentially expressed genes within a window extending 0.2 cM either side of the lead SNP, is shown for each trait/gene list combination, with background colouring indicating the significance of the observation, as per the legend. The total number of risk intervals tested for each condition, after filtering for genome wide significance and overlapping intervals, is shown at the head of each column; citations for lists of SNPs used are given in Methods. SNP, single nucleotide polymorphism; TEM, T effector memory. No significant enrichment for any of the three diseases was noted for genes downregulated in any gut population (ie upregulated in peripheral blood TEM relative to gut TEM, online supplementary figure S5), nor did we detect any significant enrichment for differentially expressed genes with risk loci for non-inflammatory polygenic traits tested: body mass index, height or blood cholesterol levels (figure 3). We next tested a number of diseases where the inflammatory pathology occurs outside of the intestine. We did not detect any significant enrichment for asthma, primary biliary cirrhosis, rheumatoid arthritis or systemic lupus erythematosus. However, there was a highly significant overlap between Type 1 diabetes (T1D)-associated loci and genes upregulated in CD4+ and CD8+ LPLs and CD8+ IELs. Likewise, we found significant overlap for psoriasis risk loci and genes upregulated in both LPL TEM populations; for multiple sclerosis (MS), risk loci showed significant overlap with genes upregulated in CD4+ LPL TEM cells, but also with genes downregulated in CD8+ IEL and LPL TEM cell populations. Several of these immune diseases share multiple genetic susceptibility loci. However, the enrichment around SNPs associated with extraintestinal pathology was not solely restricted to those genetic loci shared with GI inflammatory diseases (figure 4). Annotation of disease-associated SNPs with genes showing differential expression in intestinal TEM populations. For each of disease SNP-differential gene list combinations for which the degree of overlap reaches statistical significance (as shown in figure 3), those risk loci (encompassing a 0.2 cM window either side of the focal SNP) that contain a gene differentially expressed in a gut TEM cell population are shown. Also indicated are the positional candidate genes identified as of interest in the original papers reporting genetic association. Where a risk locus is associated with a specific disease, the intersection between the locus (rows) and disease (columns) is shaded; where this is associated with a differentially expressed gene, the gene name(s) are indicated in the subcolumn for the appropriate TEM population. Note that where there is an association between a risk locus and a disease, but no differentially expressed gene at that risk locus in a given TEM subpopulation, the corresponding cell is shaded, but left empty. Note also that for risk loci shared between different diseases, the focal SNP may vary between diseases as indicated in the figure footnote. BMI, body mass index; IEL, intraepithelial lymphocytes; LPL, lamina propria lymphocytes; MS, multiple sclerosis; PBC, primary biliary cirrhosis; RhA, rheumatoid arthritis; SLE, systemic lupus erythematosus; SNP, single nucleotide polymorphism; T1D, Type 1 diabetes; TEM, T effector memory. UC and CD represent two related forms of IBD, with considerable overlap of genetic risk loci.2 In order to test for the signature of a common transcription factor whose activity might link gut T cell expressed genes with risk loci for IBD, we employed chromatin immunoprecipitation enrichment analysis, a computational approach based on the identification of clusters of upregulated and downregulated genes sharing common transcription factor binding sites in their promoter regions, as identified by chromatin immunoprecipitation assays.44 We identified HNF4a as a potential key transcription factor associated with patterns of gene expression seen in CD4+ and CD8+ LPL TEM cells. Importantly, binding sites for HNF4a were significantly enriched at IBD associated SNPs that lay close by an LPL TEM upregulated gene, but not at IBD associated SNPs that do not map to upregulated genes (p=0.01, see online supplementary table S1). Deletion of Hnf4a in murine intestinal epithelial cells results in spontaneous colitis,45 and HNF4a is a candidate gene at the UC risk locus tagged by rs60173422; however, a role for HNF4a in T cell homeostasis remains unexplored. Using a range of experimental and bioinformatic procedures to overcome the barriers associated with the study of primary human GI T cells under homeostatic conditions, we report here unbiased expression microarray data for minimally manipulated T cells from the small intestine of tightly matched, healthy controls. We demonstrate that this approach allows the identification of genes upregulated in specific gut T cell subsets and that these genes cluster non-randomly around risk loci for inflammatory pathologies, thus providing an alternative novel approach to candidate gene identification at GWAS risk loci. The only previously reported human intestinal T cell transcriptional studies used prolonged in vitro culture and expansion of clones derived from atypical IEL T cells associated with refractory CeD.46 ,47 Here, we used material from just eight ileal biopsies, allowing study of physiologically relevant tissue from healthy control individuals rather than dependence upon diseased explants. Low cell yields associated with the use of biopsies and high stringency cell sorting, necessitated working with 1 ng starting RNA, and hence required rigorous laboratory and bioinformatic procedures to generate reliable microarray data (see online supplementary figure. S1G,H). Furthermore, through these procedures we were able to minimise interindividual variation to a remarkable extent (figure 1A) and to demonstrate statistically significant differences in gene expression using just six donors. Notably a recent report of tissue-specific patterns of gene expression for primary human dendritic cells, isolated from four skin donors and six unpaired blood donors, gained meaningful insight despite comparatively small sample sizes.48 Likewise, other investigators have performed insightful transcriptomic analysis of human intestinal dendritic cell subsets using unpaired samples from three to five individuals per cell type with comparison to peripheral blood and skin biopsies from different individuals.49 The pairwise comparison of samples from the same individual that we were able to make in our study further underpins the validity of our analysis. We went to extensive lengths to minimise cellular perturbation by keeping the isolation process brief and working at 4° C wherever possible. Cell sorting, in particular, can induce cellular stress. For this reason we used chilled, preservative-free flow buffers at low pressures with a large nozzle size, and sorted cells directly into a lysis and RNA stabilisation buffer to minimise the risk of effects on RNA transcription. Exposure of peripheral blood mononuclear cells to the conditions used for IEL and LPL isolation prior to cell sorting did not lead to significant detectable changes in TEM gene expression, reducing the possibility of transcriptomic differences arising as an artefact of cell isolation (see online supplementary figure S6). The gut transcriptomes generated in the current study for the four most abundant human intestinal T cell populations now allow interrogation of gene expression in these critical populations in man. It is notable that 25% of known IBD risk loci contain a gene showing differential upregulation within an LPL TEM cell population under homeostatic conditions, while 35% of CeD loci contain a gene upregulated in LPL or IEL TEM cells. Although we chose a window size of 0.2 cM either side of the focal SNP, in line with previous studies of the cis-acting regulatory effects of genetic variants,8 similar significant enrichment at risk loci was seen when using smaller window sizes of 0.1 cM (data not shown). Our choice of threshold for genes showing differential expression of ≥1.4-fold change is based upon estimates of the threshold for reliability of expression microarrays from quantitative PCR validation studies50 and is consistent with the approach taken in recent T cell transcriptomic studies.51 Reassuringly, repeating our analysis of GWAS risk loci for enrichment in genes showing ≥2-fold change revealed minimal differences in the enrichments observed compared with those we had observed using genes showing ≥1.4-fold change (data not shown). This enrichment points to the importance of genes involved in intestinal T cell homeostasis in predisposition to gut inflammation and hence to the primacy of these cells and genes in disease pathogenesis. That GWAS risk loci might also be enriched for genes showing upregulation in intestinal immunocytes under conditions of already established intestinal inflammation is not investigated in the present study, but merits further exploration. Nonetheless, there is a strong rationale to study genetic relationships in cells from healthy individuals,52 in keeping with a variety of important studies in the field.53–55 The use of tissue from healthy individuals represents an opportunity to study the relevance of GWAS loci in biologically relevant cell types and represents a logical extension to prior attempts to understand GWAS data in the context of immortalised cell lines56 or ex vivo differentiated tissue.57 Ultimately, identifying causal genes and linking their altered expression to GWAS risk SNPs requires a plausible biological mechanism or demonstration of allele-specific expression, or both,53 tasks which are technically challenging even when working with primary human cell types that can be sampled with relative ease, such as peripheral blood. The tissue-specificity of intestinal transcriptomic signatures we report serves as an important reminder of the fundamental limitations in attempts to infer biological insight from such readily accessible peripheral blood cell types. In many instances, the gene-SNP overlaps we observe implicate an already proposed candidate gene, lending support to existing analyses, as well as highlighting the potential importance of a specific population of gut immune cells (figure 4). For example, the IBD associated risk variant rs1819333 on chromosome 6 lies over 160 kB upstream of CCR6, a candidate gene previously implicated from in silico analysis; our finding of differential upregulation of transcripts for CCR6 in LPL TEM lends weight to this case. Likewise, rs11742570 lies almost 270 kB upstream of the LPL TEM cell upregulated gene PTGER4, which encodes a prostaglandin E receptor shown to regulate T cell activation and TH17 signalling58 and which has been identified as a candidate IBD risk gene through in silico analysis.2 In contrast, in a gene-dense region of chromosome 2 with risk variants associated with IBD, CeD and psoriasis, previous in silico analyses have suggested multiple alternative candidate genes2 ,4 ,59; we find that at this locus the canonical NF-κB transcription factor REL is strongly upregulated in LPL TEM cell populations compared with peripheral blood TEM cells. Other examples of informative gene-SNP overlaps we observed include rs17391694, which marks a region on chromosome 1 associated with CD risk, and lies 140 kB downstream of DNAJB4, which we show to be highly expressed in LPL TEM cells. DNAJB4 is a HSP-40 family member, only recently described and barely studied in the literature; consequently, in silico analysis did not detect any candidate genes within the rs17391694 risk locus.2 Of multiple other similar examples for IBD, we note our LPL TEM transcription based identification of DENNDB1, a guanine nucleotide exchange factor upregulated in memory T cells,62 as a candidate gene for rs2488389 (C1orf53 previously reported based upon in silico analysis); ZFP36L2, a putative regulator of thymocyte differentiation,63 for rs10495903 (no previous candidate gene reported); ZNF394, a barely studied gene intriguingly reported to regulate AP-1 signalling,64 for rs9297145 (SMURF1 previously reported based upon lymphoblastoid cell line eQTL analysis65); EGR2, a recently reported regulator of TH17 effector function66 for rs10761659 (no previous candidate gene reported); and PPIF, a recently reported regulator of apoptosis as well as chemotaxis67 for rs1250546 (no previous candidate gene reported). Normal development and function of murine, and by inference human, intestinal T cells is critically dependent upon microbial cues,18 suggesting that many of the pathways we have identified will be driven by interactions with the gut microflora. Indeed, we note significant overlap between transcripts upregulated in CD4+ LPL TEM cells and previous reports of the transcriptional changes induced in murine CD4+ LPL after colonisation of germ-free mice.14 Considerable evidence now supports the observation that the intestinal microbiota modulates local inflammation but also systemic immune-mediated pathologies.41 Indeed, T1D and MS exhibit evidence for disease modification by the gut microbiota in animal models and human studies.39 ,40 ,68 In this context, our observation that risk loci for T1D, MS and psoriasis are significantly enriched for genes overexpressed in specific populations of gut T cells may potentially offer novel insight into mechanisms of host-environment interactions in these common diseases. In summary, we report the first transcriptomes for the four major human gut T cell populations and highlight substantial differences from peripheral blood T cells, suggesting novel, potentially gut-specific targets for T cell modulation. 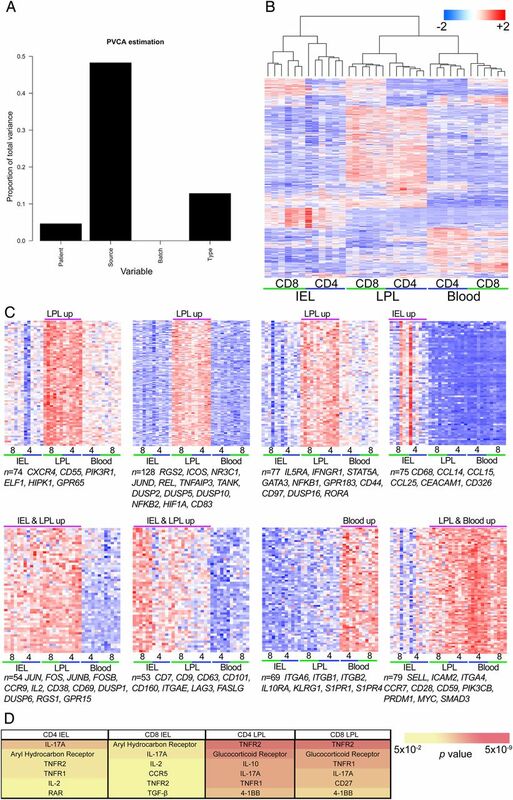 Using biopsies from a modest number of healthy study subjects allied to careful isolation and sophisticated bioinformatic analysis techniques, we show that the human intestinal T cell compartment can be made accessible for transcriptomic studies and may provide useful insight into genetic loci associated with inflammatory pathologies. The opportunity now arises to interrogate other human tissue resident cell transcriptomes in a variety of disease states, including those highlighted in the current study. The authors thank S McCallum and A Schwarzer for technical assistance with cell sorting; I McFarlane, M Johnson and N Zacchi for technical assistance with expression microarrays; E Carr for discussions regarding microarray analysis; A Hayday for insightful scientific criticism; E Andersen and C Dawson for assistance with patient recruitment and sample collection; M Lanio for help with experimental work.
. High-density genetic mapping identifies new susceptibility loci for rheumatoid arthritis. Nat Genet 2012;44:1336–40.
. Bayesian refinement of association signals for 14 loci in 3 common diseases. Nat Genet 2012;44:1294–301.
. Dense genotyping identifies and localizes multiple common and rare variant association signals in celiac disease. Nat Genet 2011;43:1193–201.
. Unraveling the regulatory mechanisms underlying tissue-dependent genetic variation of gene expression. PLoS Genet 2012;8:e1002431.
. Genetics of gene expression in primary immune cells identifies cell type-specific master regulators and roles of HLA alleles. Nat Genet 2012;44:502–10.
. Chromatin marks identify critical cell types for fine mapping complex trait variants. Nat Genet 2013;45:124–30.
. Guarding the perimeter: protection of the mucosa by tissue-resident memory T cells. Mucosal Immunol 2013;6:14–23.
. Dynamics of blood-borne CD8 memory T cell migration in vivo. Immunity 2004;20:551–62.
. Intestinal T cells: facing the mucosal immune dilemma with synergy and diversity. Semin Immunol 2009;21:130–8.
. Gene-expression profiles and transcriptional regulatory pathways that underlie the identity and diversity of mouse tissue macrophages. Nat Immunol 2012;13:1118–28.
. Naturally transmitted segmented filamentous bacteria segregate with diabetes protection in nonobese diabetic mice. Proc Natl Acad Sci U S A 2011;108:11548–53.
. Genomic definition of multiple ex vivo regulatory T cell subphenotypes. Proc Natl Acad Sci U S A 2010;107: 5919–24.
. Mouse TCRalphabeta+CD8alphaalpha intraepithelial lymphocytes express genes that down-regulate their antigen reactivity and suppress immune responses. J Immunol 2007;178:4230–9.
. The burden of inflammatory bowel disease in Europe. J Crohn's Colitis 2013;7:322–37.
. The gut microbiota--masters of host development and physiology. Nat Rev Microbiol 2013;11:227–38.
. Human intestinal lamina propria and intraepithelial lymphocytes express receptors specific for chemokines induced by inflammation. Eur J Immunol 2000;30:819–26.
. Biological insights into TCRgammadelta+ and TCRalphabeta+ intraepithelial lymphocytes provided by serial analysis of gene expression (SAGE). Immunity 2001;15:419–34.
. Evaluation of methods for amplification of picogram amounts of total RNA for whole genome expression profiling. BMC Genomics 2009;10:246.
. Exon array data analysis using Affymetrix power tools and R statistical software. Brief Bioinform 2011;12:634–44.
. Adhesion between epithelial cells and T lymphocytes mediated by E-cadherin and the alpha E beta 7 integrin. Nature 1994;372:190–3.
. Human G protein-coupled receptor GPR-9–6/CC chemokine receptor 9 is selectively expressed on intestinal homing T lymphocytes, mucosal lymphocytes, and thymocytes and is required for thymus-expressed chemokine-mediated chemotaxis. J Exp Med 1999;190: 1241–56.
. The roles of CCR6 in migration of Th17 cells and regulation of effector T-cell balance in the gut. Mucosal Immunol 2009;2:173–83.
. Cutting Edge: Regulator of G protein signaling-1 selectively regulates gut T cell trafficking and colitic potential. J Immunol 2011;187:2067–71.
. CXCL10-producing mucosal CD4+ T cells, NK cells, and NKT cells are associated with chronic colitis in IL-10(-/-) mice, which can be abrogated by anti-CXCL10 antibody inhibition. J Interferon Cytokine Res 2008;28:31–43.
. Strong overexpression of CXCR3 axis components in childhood inflammatory bowel disease. Inflamm Bowel Dis 2010;16:1882–90.
. The alliance of sphingosine-1-phosphate and its receptors in immunity. Nat Rev Immunol 2008;8:753–63.
. Both integrated and differential regulation of components of the IL-2/IL-2 receptor system. Cytokine Growth Factor Rev 2006;17:349–66.
. A genomic regulatory element that directs assembly and function of immune-specific AP-1-IRF complexes. Science 2012;338:975–80.
. BATF-JUN is critical for IRF4-mediated transcription in T cells. Nature 2012;490:543–6.
. A validated regulatory network for Th17 cell specification. Cell 2012;151:289–303.
. The aryl hydrocarbon receptor in immunity. 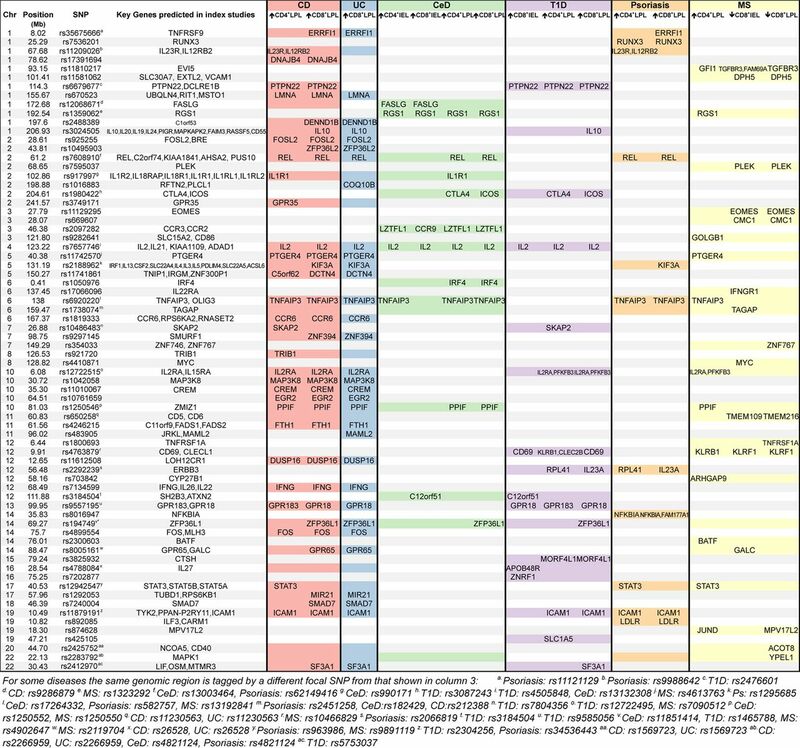 Trends Immunol 2009;30:447–54.
. Fate mapping of IL-17-producing T cells in inflammatory responses. Nat Immunol 2011;12:255–63.
. The genetics universe of Crohn's disease and ulcerative colitis. Dig Dis 2012;30(Suppl 1):78–81.
. Commensal microbiota and myelin autoantigen cooperate to trigger autoimmune demyelination. Nature 2011;479:538–41.
. Role of the gut microbiota in immunity and inflammatory disease. Nat Rev Immunol 2013;13:321–35.
. Paradoxical coexpression of proinflammatory and down-regulatory cytokines in intestinal T cells in childhood celiac disease. Gastroenterology 2002;123:667–78.
. Intraepithelial and lamina propria lymphocytes show distinct patterns of apoptosis whereas both populations are active in Fas based cytotoxicity in coeliac disease. Gut 2001;49:380–6.
. Expression2Kinases: mRNA profiling linked to multiple upstream regulatory layers. Bioinformatics 2012;28:105–11.
. Loss of hepatocyte-nuclear-factor-4alpha affects colonic ion transport and causes chronic inflammation resembling inflammatory bowel disease in mice. PLoS One 2009;4:e7609.
. Reprogramming of CTLs into natural killer-like cells in celiac disease. J Exp Med 2006;203:1343–55.
. Identification of a potential physiological precursor of aberrant cells in refractory coeliac disease type II. Gut 2013;62:509–19.
. Human tissues contain CD141hi cross-presenting dendritic cells with functional homology to mouse CD103+ nonlymphoid dendritic cells. Immunity 2012;37:60–73.
. Comparative transcriptional and functional profiling defines conserved programs of intestinal DC differentiation in humans and mice. Nat Immunol 2014;15:98–108.
. Microarray validation: factors influencing correlation between oligonucleotide microarrays and real-time PCR. Biol Proced Online 2006;8:175–93.
. Transcriptional insights into the CD8(+) T cell response to infection and memory T cell formation. Nat Immunol 2013;14: 404–12.
. Closing the gap between genotype and phenotype. Nat Genet 2009;41:958–9.
. Cell-specific protein phenotypes for the autoimmune locus IL2RA using a genotype-selectable human bioresource. Nat Genet 2009;41:1011–15.
. Type 1 diabetes-associated IL2RA variation lowers IL-2 signaling and contributes to diminished CD4+CD25+ regulatory T cell function. J Immunol 2012;188:4644–53.
. Human SNP links differential outcomes in inflammatory and infectious disease to a FOXO3-regulated pathway. Cell 2013;155:57–69.
. Linking disease associations with regulatory information in the human genome. Genome Res 2012;22: 1748–59.
. Many Inflammatory Bowel Disease Risk Loci Include Regions That Regulate Gene Expression in Immune Cells and the Intestinal Epithelium. Gastroenterology 2013;146:1040–7.
. A novel antagonist of the prostaglandin E(2) EP(4) receptor inhibits Th1 differentiation and Th17 expansion and is orally active in arthritis models. Br J Pharmacol 2010;160:292–310.
. Identification of 15 new psoriasis susceptibility loci highlights the role of innate immunity. Nat Genet 2012;44:1341–8.
. Amphiregulin enhances regulatory T cell-suppressive function via the epidermal growth factor receptor. Immunity 2013;38:275–84.
. A survey of the genetics of stomach, liver, and adipose gene expression from a morbidly obese cohort. Genome Res 2011;21:1008–16.
. Molecular signatures distinguish human central memory from effector memory CD8 T cell subsets. J Immunol 2005;175:5895–903.
. Deletion of the RNA-binding proteins ZFP36L1 and ZFP36L2 leads to perturbed thymic development and T lymphoblastic leukemia. Nat Immunol 2010;11:717–24.
. Inhibition of transcriptional activities of AP-1 and c-Jun by a new zinc finger protein ZNF394. Biochem Biophys Res Commun 2004;320:1298–305.
. Early growth response gene-2 controls IL-17 expression and Th17 differentiation by negatively regulating Batf. J Immunol 2013;190:58–65.
. Cyclophilin D extramitochondrial signaling controls cell cycle progression and chemokine-directed cell motility. J Biol Chem 2013;288:5553–61.
. Gut microbiome metagenomics analysis suggests a functional model for the development of autoimmunity for type 1 diabetes. PLoS One 2011;6:e25792. MP and AK contributed equally. Contributors TR designed, performed and analysed experiments and genetic enrichment analysis, and wrote the manuscript; JZL designed and performed genetic enrichment analysis and wrote the manuscript; CAA, MP and AK helped design and analyse experiments and wrote the manuscript. Funding Supported by the Wellcome Trust (WT091993MA postdoctoral clinical fellowship to TR), European Crohn's and Colitis Organisation (ECCO research grant to TR), and the National Institute of Health Research (NIHR) Biomedical Research Centre award to Addenbrooke's Hospital/University of Cambridge School of Clinical Medicine. Ethics approval Cambridge NHS Research Ethics Committee. Data sharing statement On publication of this study, all original data will be made freely available online through the GEO Accession Browser (accession number GSE49877).